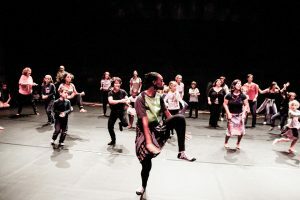 In these workshops, BYP’s artists teach children and young people some choreographies and techniques of traditional African dance and percussion. The workshops can have different lengths, depending on the participants’ objectives. They can range from a basic workshop lasting a few hours (introductory) to more intense workshops lasting anywhere from three days (beginner level) to two weeks (intermediate level). In the dance workshops, participants learn a choreography and are encouraged to contribute with their own ideas and rhythms, practicing their own dance solos. 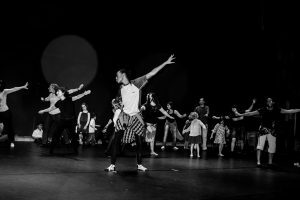 At the end of the dance workshops, a performance usually takes place where all workshop participants join in, along with BYP’s musicians and dancers. 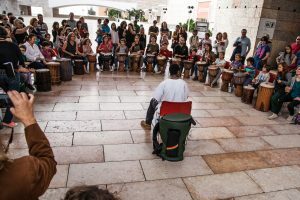 In the African percussion workshops, participants are invited to explore music and rhythm, playing various African percussion instruments (djembe, conga, dumba) and other complementary instruments (checkeré). For more information or requests, please contact us. Check out our Gallery to see more photos and videos of our performances.